A fast, secure service, for export, or import, managed by Dynamic International’s air freight specialists. Dynamic work with preferred carriers at airports across the globe. Door to door, or door to airport services are available for single, or complex shipments, or airline charter where required. 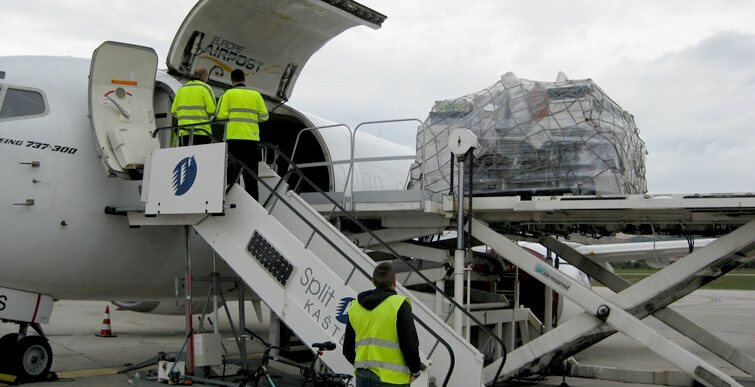 Air freight options include standard and express delivery, or an efficient courier service, with items accompanied on their journey if you wish. Whichever approach meets your need, our packing and handling teams offer support. With the experience to manage valuable, fragile, hazardous, or temperature sensitive items and understand the regulations for each. Finding a safe route for your shipments is simply a start. Dynamic handle a number of time sensitive contracts, for events, or filming and bring the skills applied there to all air freight clients. Helping with pre shipment inspection, letters of credit and destination clearance is part of our service. Guidance, or implementation are readily available on customs documentation, marking, or labelling. Our ATA carnet unit organises temporary exports and imports, a full range of insurance options are there for you. Every facet of worldwide regulatory compliance is considered. Dynamic are a UK regulated aviation security agent and care for items you entrust to us but above all, we care for the objectives you set. Air freight can be a key business tool and a good freight handler should appreciate the business relevance. Ensuring documents for an important meeting, or equipment for an exhibition arrive at the place and time you set. Dynamic International manage your shipment to ensure this happens. Advice, packing, documentation and great partners across the globe are built into our service, we don’t interfere but watch your back where that helps. If a partnership approach, rather than just an air freight service appeals, we hope you will get in touch and look forward to working with you. Air freight is an ideal way to ensure prompt delivery, for your business deadlines, or those of your customers. We really are here to help & advise.